The Thin T-Junction Chip is a glass microfluidic device designed for a range of applications including mixing fluids, microreactions and droplet formation. The chip offers an ultra-thin 150 µm base layer for high magnification microscopy applications. 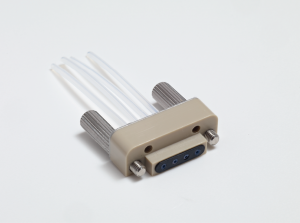 It is supplied with a chip header that allows connection to the Linear Connector 4-way. The Platinum T-Junction Chip is a glass microfluidic device designed for a range of applications including mixing fluids, microreactions and droplet formation. The platinum coating on the surface of the channel makes this chip ideal for various catalysis led reaction chemistries. The chip is supplied with a chip header that allows connection to the Linear Connector 4-way. The Quartz T-Junction Chip is a synthetic quartz microfluidic device designed for a range of applications including mixing fluids, microreactions and droplet formation. The chip is supplied with a Chip Header that allows connection to the Linear Connector 4-way. The T-Junction Chip is a glass microfluidic device designed for a range of applications including mixing fluids, microreactions and droplet formation.The chip is supplied with a chip header that allows connection to the Linear Connector 4-way and features a diced end which provides a flow path that bypasses the length of serpentine channel downstream of the junction and flows directly out of the chip edge. The primary function of this chip is for the ejection of droplets into bulk liquid without disruption to the flow and is compatible with the Droplet Collection Module. 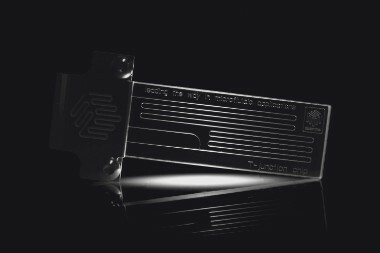 The T-Junction Chip is a glass microfluidic device designed for a range of applications including mixing fluids, microreactions and droplet formation. The chip is supplied with a chip header that allows connection to the Linear Connector 4-way and features a diced end which provides a flow path that bypasses the length of serpentine channel downstream of the junction and flows directly out of the chip edge. The primary function of this chip is for the ejection of droplets into bulk liquid without disruption to the flow and is compatible with the Droplet Collection Module. 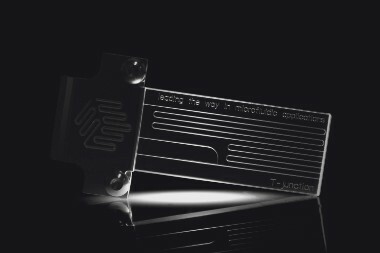 The T-Junction Chip is a glass microfluidic device designed for a range of applications including mixing fluids, microreactions and droplet formation. The chip is supplied with a chip header that allows connection to the Linear Connector 4-way.